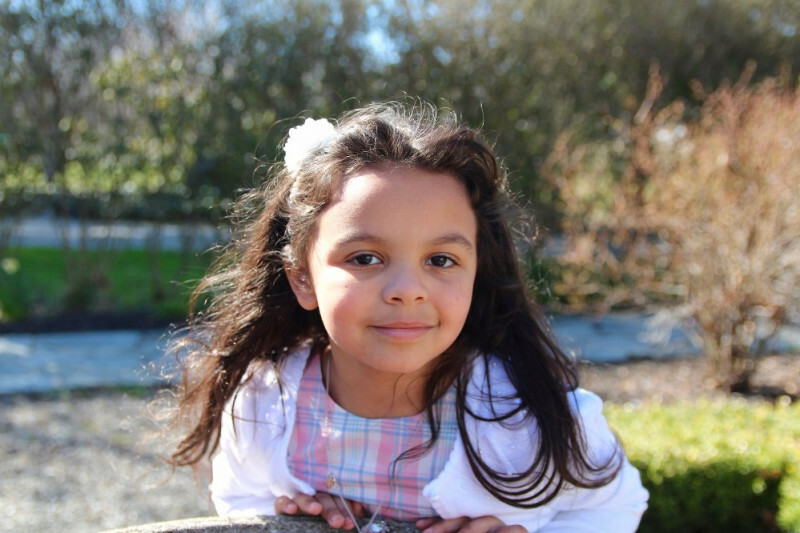 Posted on February 27, 2019 by William A. 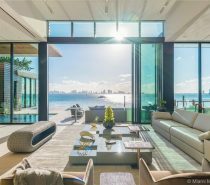 Set on land at the southern end of Dilido Island, this magnificent Miami home has been designed to evoke the experience of being on the deck of a super yacht. 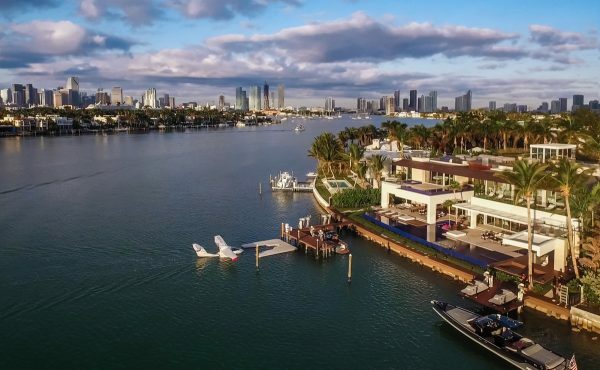 The luxury house stretches across the longest elevation of the coastline, and boasts enviable views of neighbouring islands, of downtown and South Beach. 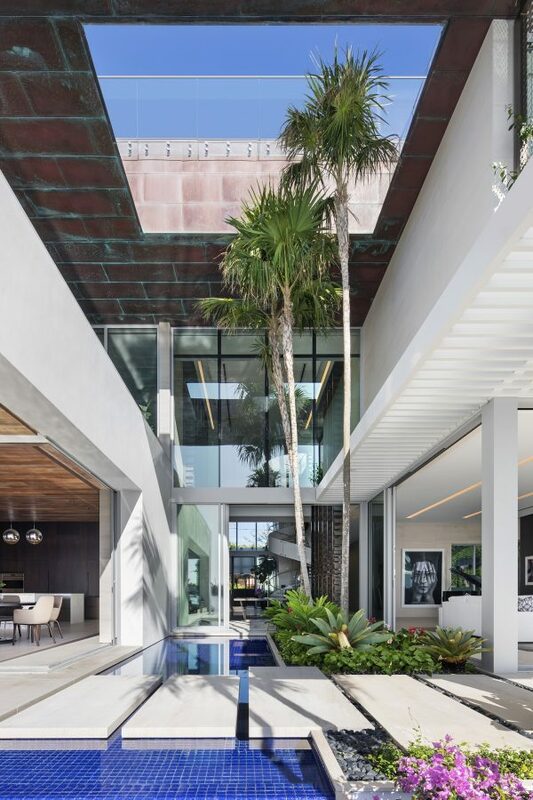 SAOTA architects designed Casa Dilido to match the jet set lifestyle of Biscayne Bay, creating layers of luxury across a 1670 square metre living space. 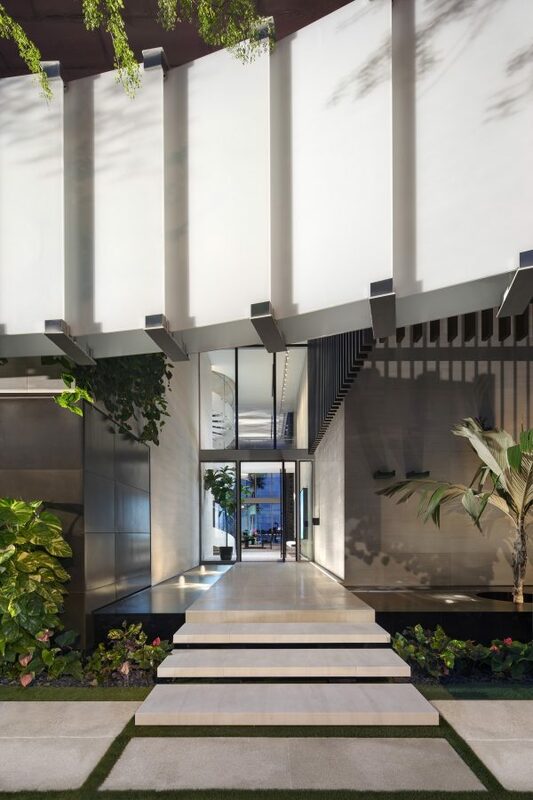 The defining characteristic of the build is a smooth fusion of indoor and outdoor spaces, a theme that is made possible by a versatile terrace that incorporates a collection of semi-covered external living rooms. Crisp cool white outdoor lounge chairs are neatly arranged around the sun terrace, where towering palm trees reach up to clear blue skies. 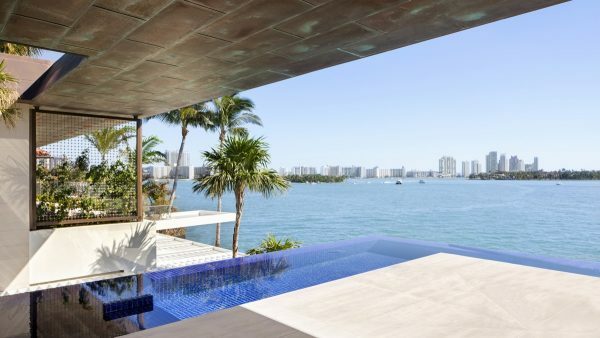 An infinity pool reflects the azure heavens, and laps around the sharp edge of the outdoor living space. Two mooring docks reach out from the house to meet jet skis and small boats, keeping the flow between land and sea continuous and fluid. 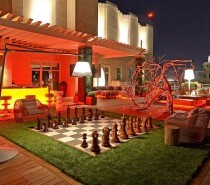 There is also an outdoor bar at the far end of the terrace, with a row of stools standing poised for good company. Martini seats have been installed in shallow water, and an outdoor pop-up table waits at the water’s edge on which to serve dinner. Tropical flower beds colour the white stone sun terrace. A path of white stepping stones leads cross the infinity pool’s shimmering surface. 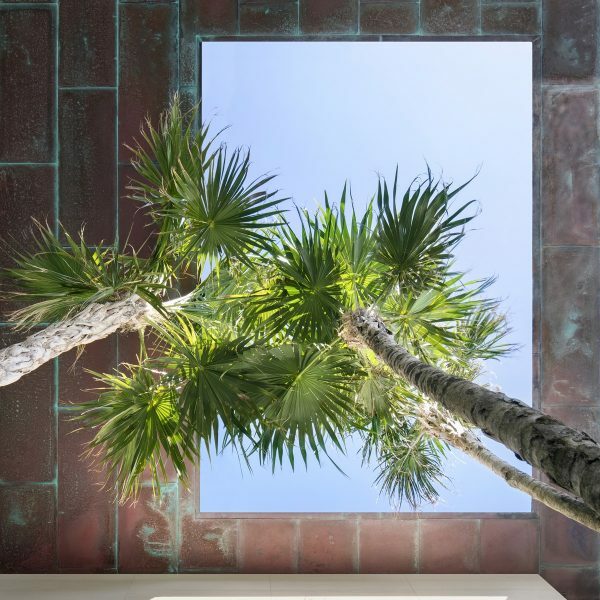 The plant beds are positioned below an opening in the terrace roof, to allow the planted palm trees to grow right on through. The maturing palms will shoot through the open roof and past a glass balustrade a couple of storeys up. A tower of multi-story windows look upon the view. A bright verdigris patina colours the edges of pre-oxidized copper ceiling tiles under the canopy. Multiple entertaining areas are incorporated into the versatile terrace. Here we see a sunken tub in the swimming pool, nestled close by a lounge area that’s fashioned by a square of modern outdoor chairs and a natural wood coffee table. Square stepping stones cross the water at the this end, adjoining the main terrace to the outdoor bar. Views of downtown and South Beach span the horizon. Moving inside the home, the decor is formal yet fresh. Red art provides youthful pops of vivid colour onto the neutral backdrop of the modern living room. A contemporary fireplace blazes along the width of a slick panelled chimney breast. Cutaway strips in the wood ceiling reveal LED light sources. 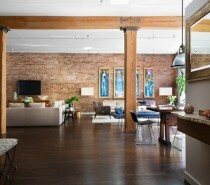 The centre of the room is occupied by a unique coffee table with storage space beneath, settled on a silver-grey rug. A black accent chair with matching footstool stands in the connecting space between the lounge and the kitchen diner, where the same monochrome palette continues on through. Mezmerising cutaway bronze panels screen the kitchen from the main internal core of the home on the other side. 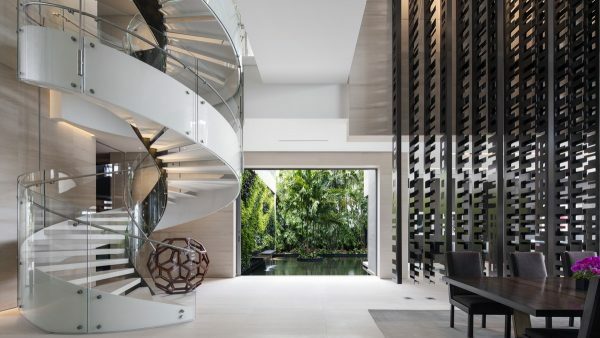 On the opposite side of the huge bronze screens, which are hung from the ceiling, a majestic white and glass staircase design spirals upward through a double height dining room. The sculptural architectural elements and works of art breathe character into the vast and lofty hall. 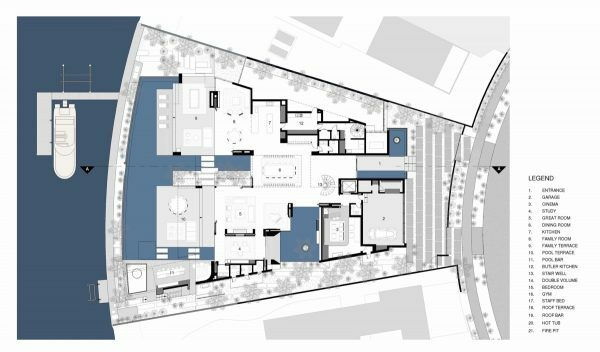 Given the massive floor area of the brief, the architects searched out a balance between scale and intimacy by composing the layout as two fractured wings on each side of the central core. Outside again, a vertical garden blankets the wall by a koi pond. 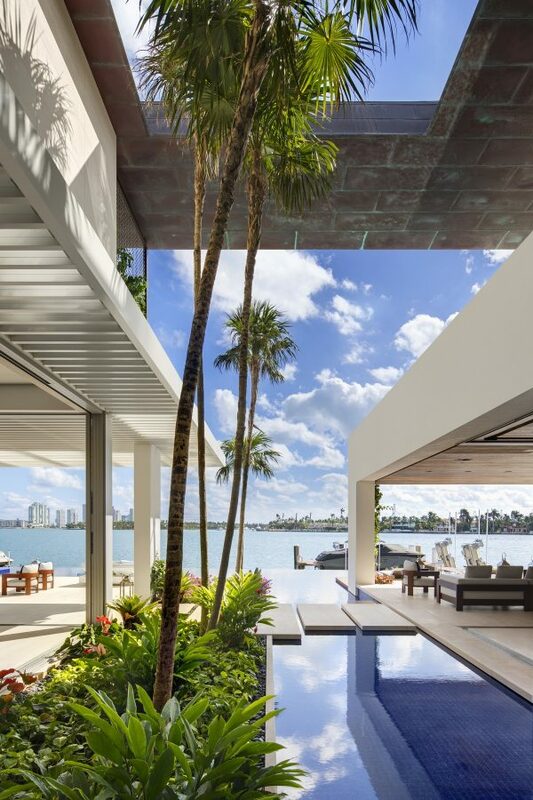 Interior volumes reach out into the water. The hanging bronze screens sandwich a dark wood table and heavy dining chairs, all set upon a light grey area rug. 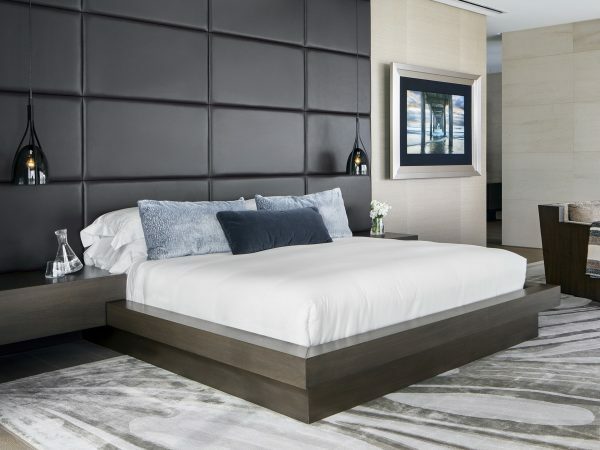 Designer bedroom pendant lights glow at each side of a bespoke headboard design. The bed base and bedside units are custom built too, running as one adjoined volume. Restricted entrance is gained via the Venetian Causeway. A double-volume entrance hall awaits. 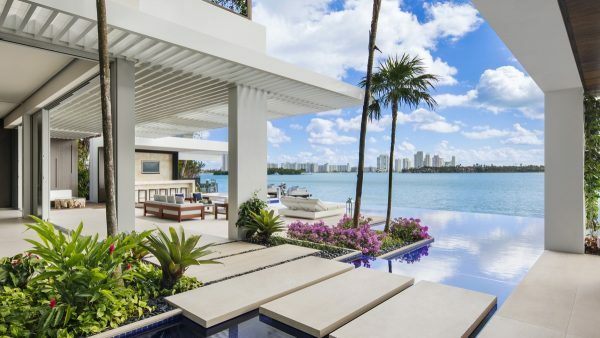 Pure white stucco gleaming in the sunshine, grey limestone, brass and copper detailing, azure pools and green landscapes come together in a classy show of luxury that’s just perfect for Biscayne Bay. Lush borders colour a generous driveway. Exterior volumes of wall become connected by the implementation of a curved glass screen across the fascia of the building. Floor plan illustrating the upper level and layout of the main bedrooms. The master bedroom has a generously sized ensuite with whirlpool bath. The three almost identically sized bedrooms with matching waterside views were created for the three daughters of the owner. 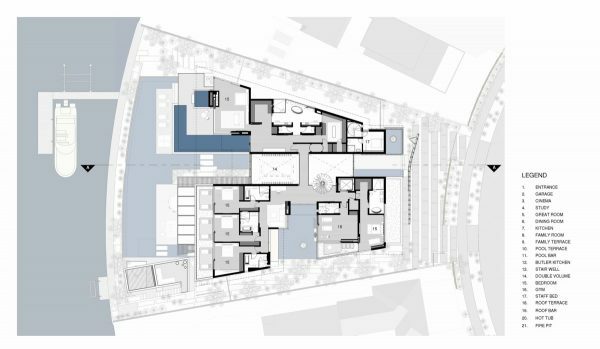 Ground floor plan featuring the entrance hall, great room, dining room, kitchen, butler kitchen, garage, home cinema, study, and pool terrace. 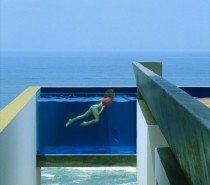 To echo the fabulous nature of the homes location by the sea with neighbouring islands, the home’s pool was made to wind around the entire house. 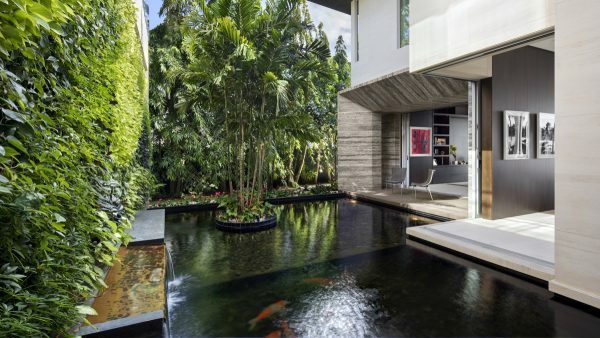 The water unifies the outdoor space, and causes smaller islands, which join together interior and exterior areas. 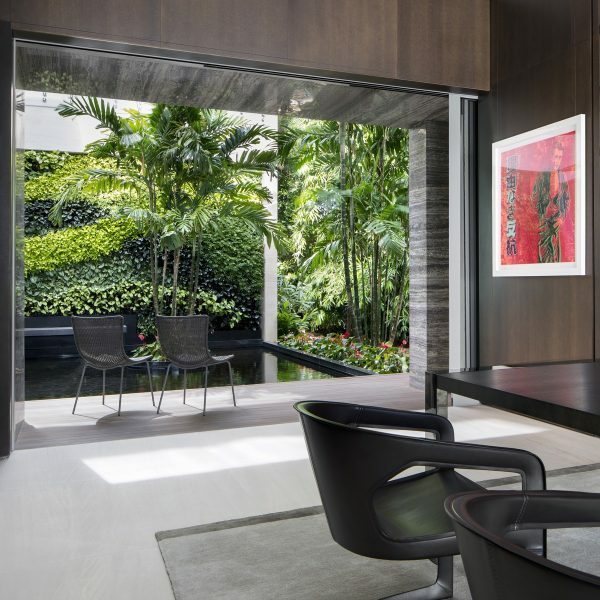 The mass of the home separates to form a dramatic canyon, which frames the view to the bay. 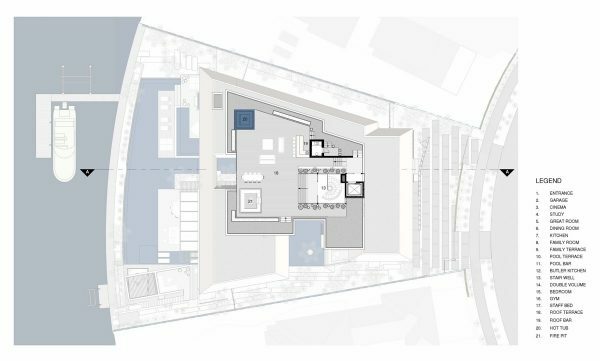 Floor plan showing roof terrace, which is accessed by an elevator. The roof terrace is equipped with a second bar, a cooking stove, and a hot tub from which the homeowner can soak up stunning views of downtown Miami, twinkling across the horizon.